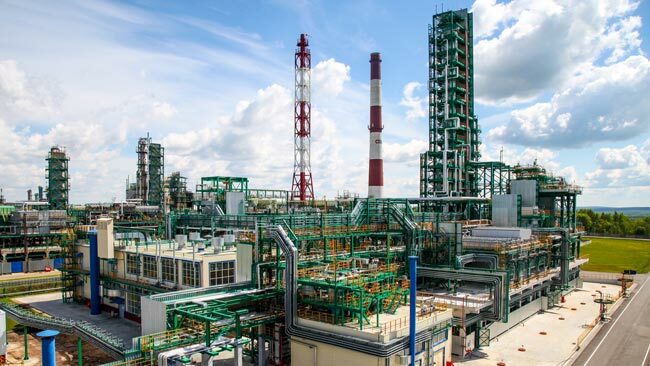 A new facility for the production of Group III base oils has been commissioned at the JSC Slavneft-YANOS refinery, part of OAO NGK Slavneft, a joint enterprise between Russia’s Gazprom Neft PJSC and Rosneft. The facility, which has a capacity to produce 100,000 tonnes of high-quality base oils per year, can produce four different viscosity grades. The commissioning of the facility will allow the replacement of up to 40% of Group III base oils currently being imported into Russia to produce high-performance lubricants. Construction of the base oil unit at the the JSC Slavneft-YANOS refinery commenced in 2015. Total investment in the project stands at RUB5.5 billion (USD95.2 million). The new facility forms part of the refinery’s production chain, with the feedstock for the base oil unit being supplied from the YANOS hydrocracking unit. Group III base oils are used to produce lubricants. The advantages of this particular type of base oil is its high viscosity, low sulphur and nitrogen content, and excellent performance at low temperatures. A promising area for the use of Group III base oils in Russia is in the production of a special fraction which can be used for drilling muds, a significant proportion of which is currently imported from abroad. “The development of the domestic oil refining industry is currently ahead of the curve. We are continually modernising production capacity and implementing ambitious plans that will result in the domestic market being supplied with high-quality Russian-produced petroleum products. Starting production of Group III base oils at the YANOS refinery will not only allow the implementation of a lubricants import substitution programme, but will also give additional impetus to the development of new products in demand from Russian consumers,” said Petr Degtyarev, director of Gazprom Neft’s Oil Refining Directorate.